Wife of the Gods introduces us to Inspector Darko Dawson of the Central Investigation Department in Accra, Ghana. Dawson is a devoted husband and father, though he also displays a rebellious and angry streak when he feels provoked. Dawson grew up in rural Ghana and has been haunted for years by his mother's disappearance seemingly into thin air one day after visiting her sister. Now, Dawson is sent back to that same area to investigate the murder of a promising medical student. What follows is a mystery that takes many twists and turns before arriving at the conclusion, and a story that introduces us not only to the moody Darko Dawson but also to his extended family. There's also a lot here about Ghanaian culture. For example, the title Wife of the Gods refers to the practice of marrying a young girl off to a religious leader to ward off bad luck. We also meet witch doctors, traditional healers and more modern doctors, learning how each interacts with the others. I enjoyed this book enough to continue with the series, though as usual for me, this is more because I am intrigued by the potential for character development much more than I am the mystery itself. I am particularly interested in seeing more of Dawson's relationship with his wife; there was one scene in the book in which his wife got very angry with him for not including her in an important decision regarding their son, and I look forward to seeing how the two of them navigate their marriage. I also hope Dawson's older brother will have more of a role in future books. In fact, I hope many of the secondary characters introduced here get more quality time in future books. 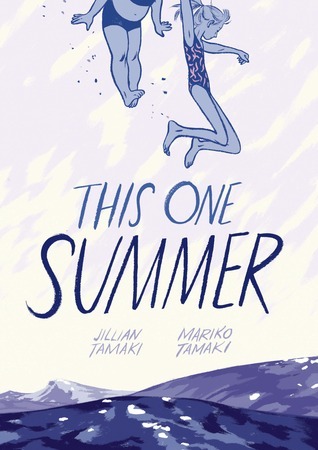 This One Summer is a great book to read in the depth of a cold, dark winter. The cover itself made me feel like I was sitting outside with a book and a glass of chilled white wine, enjoying the glorious warmth of the sun. But alas, summer has never felt further away. And when it comes, it is always far too short. 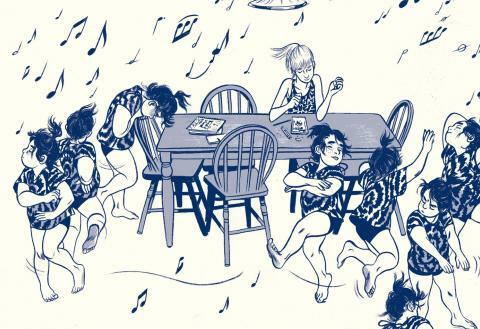 This beautifully illustrated graphic novel by the Tamaki cousins makes clear just how fleeting summer is, and just how much people can change from one year to another, just how drastically people can be impacted by an event. Rose and Windy are best friends who meet every year at the beach. But it seems like this year they are kind of drifting apart. Rose's parents are fighting a lot, and Windy doesn't understand why Rose is so obsessed with the older townie kids. I have mixed feelings about this book. On the one hand, I didn't like Rose very much, and I wasn't expecting so many heavy subjects to be covered here. On the other hand, I think the Tamakis really captured the transition from childhood to adulthood perfectly, with all its false starts and skids. Rose is just like any teenager, making snap decisions on people based on limited information, fairly self-absorbed, and almost callous in the way she treats and talks about other people. Windy, just a year and half younger than Rose, serves as a great foil to show just how painful and wide the chasm can feel sometimes between childhood and adulthood. A very realistic snapshot of a tough time in many people's lives, captured beautifully in lovely blue tones. My mystery book group read WIFE OF THE GODS several years ago and it was a positive experience. Many noted that their previous mystery reading in Africa was limited to the No. 1 Ladies Detective Agency books. And, of course, this one was much different. I meant to continue the series, but have not up to now. Thanks for the reminder and I'll go look and see what #2 Darko Dawson book is. I have This One Summer out from the library now. I actually don't really know what it's about, though I did vaguely suspect it was going to deal with a number of sad things (to go with its sad color palette). I'm having an all-comics-all-the-time week so far, and TOS is next on my list! You already know what I thought of This One Summer, to this comment is mostly for me to say that I have Wife of the Gods on my TBR pile and am excited to get to it after your review! I have seen both of these around and added them to my wish list. Who knows when I will actually get to them! I really enjoyed Kwei Quartey's book and have his others to read. The setting and cultural aspects as well as the characters are what interested me most about the series. This One Summer looks interesting. It's been ages since I last read a graphic novel. I keep checking out This One Summer from the library and returning it unread. I hope to get to it before it's due back. If you haven't read the Tamakis' previous book, Skim, you might also enjoy that, although in a complicated way, as well, as there are still some very difficult matters therein. (I agree that Rose is hard to warm to, but I also agree that it's her age which makes her that way, rather than a miss on the Tamakis' part.) I've got Kwei Quartey's mysteries on my TBR and suspect I'll be intrigued by the characters as you are: thanks for the encouragement!